Francisco led a long, interesting, and complex life, and we have been able to locate quite a bit of information to document his life. He lived half his life as Francisco Miranda in Clifton, Arizona with his first wife and five children and the second half of his life as Frank Jordan in Ray-Sonora, Arizona with his second wife and seven children. We don’t know much about his early life, but he is the only surviving child of Manuel Miranda and Refugio Jordan. Despite the fact that birth and baptism records are extremely difficult to find, we found the original baptismal record (the page looks to have been taken from the church baptismal book) as well as a baptismal certificate. 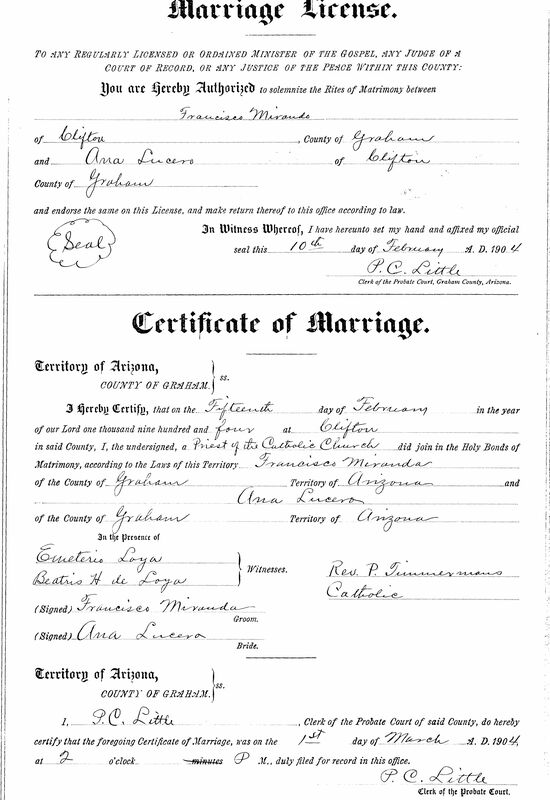 The baptismal record notes his legitimate (read: Married in the church) parents as Manuel and Refugio. 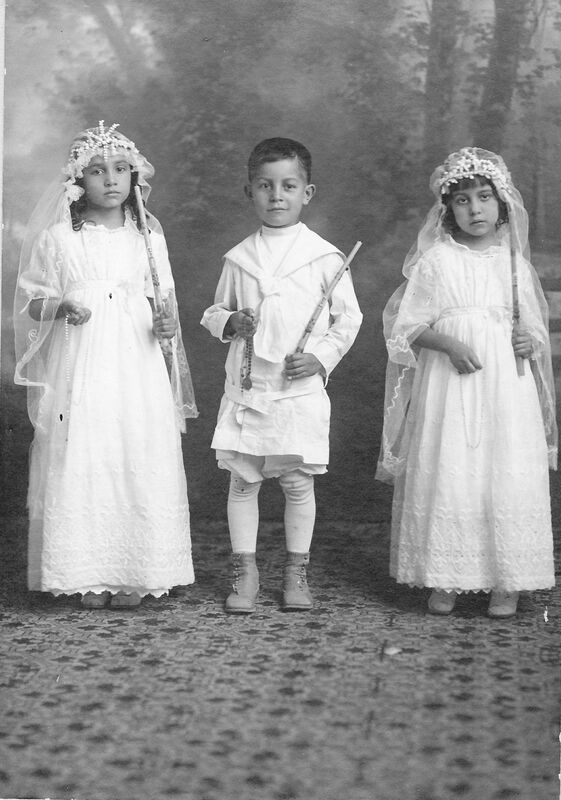 The priest who performed the baptism was a man from France named Jules Deraches (many of the priests ministering in Southern Arizona during this time frame were French). 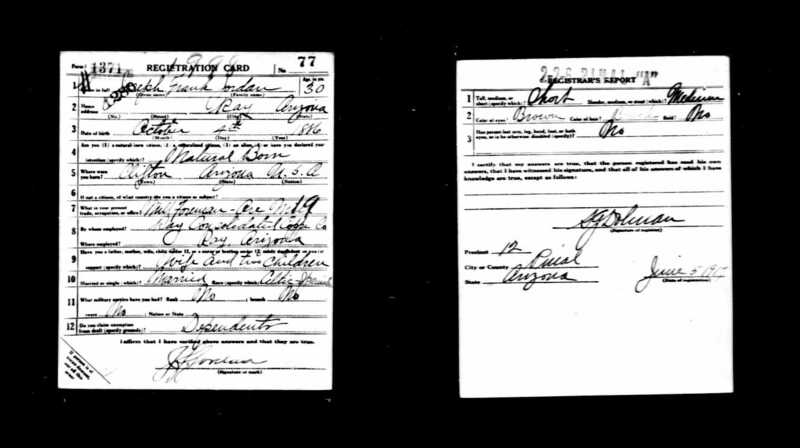 The next official record we have is the 1900 census, which lists him as a 15-year-old working as a day laborer. He is the only member of the family that is listed as being able to read, write, and speak English. 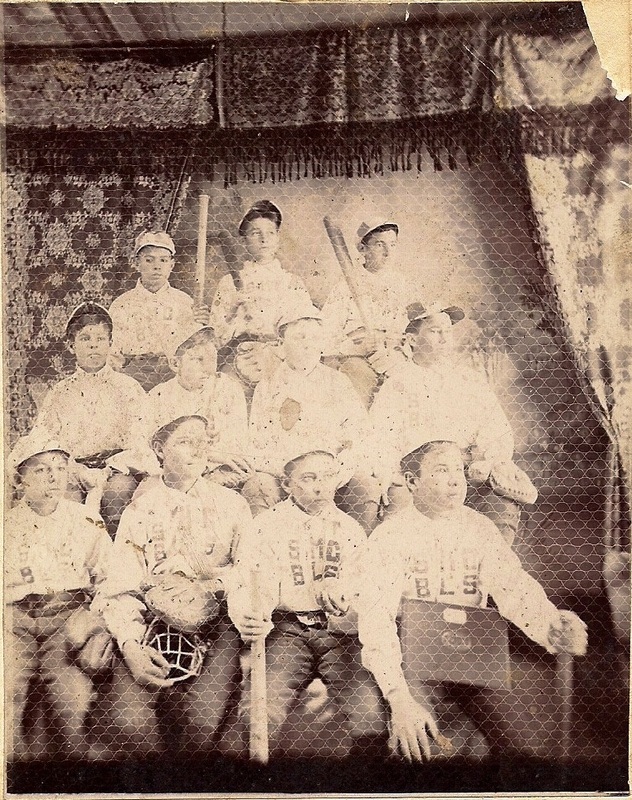 His step-grandfather Romulo Chavez sent Francisco to high school at St. Michael’s in Santa Fe, New Mexico Territory, where he was a member of the baseball team, and according to his son Raymond, was interested in becoming a priest. As of yet, we have no record as to whether Francisco graduated from high school or for how many years he studied at St. Michael’s. 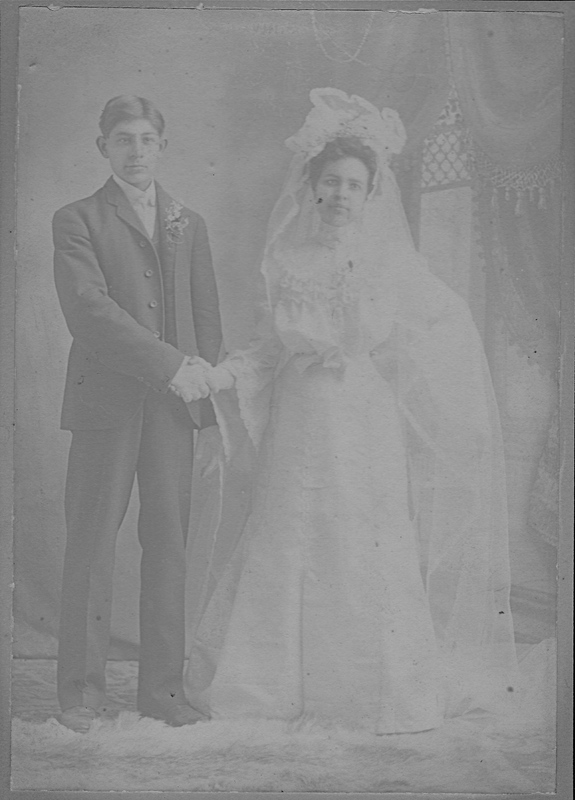 On February 15, 1904, he married Anita Lucero in Clifton, Arizona. 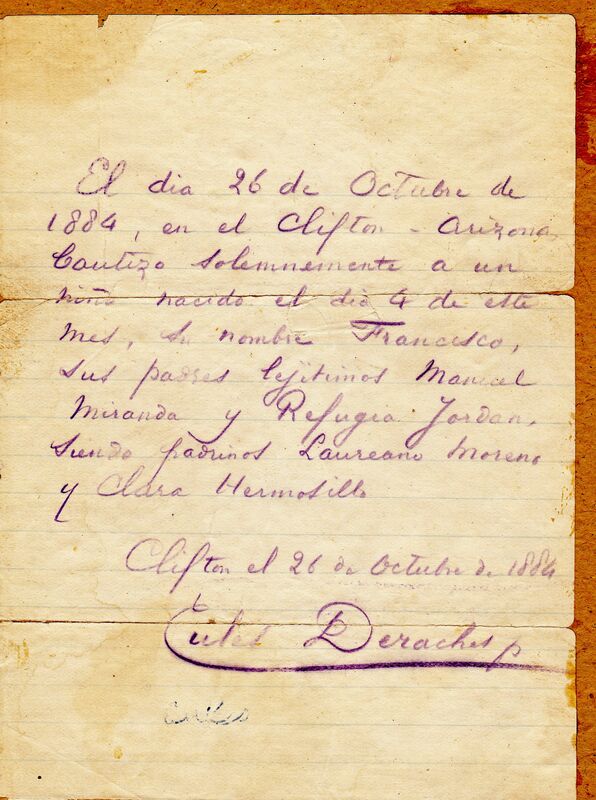 The wedding invitation was issued by Romulo Chavez and Clara Hermosillo, Francisco’s step-grandfather and grandmother, and announces a reception at their house following the Mass. The wedding took place at the Sacred Heart Catholic Church and was celebrated by Father Timmermaus. The witnesses were Emeterio Loya and Beatriz H. de Loya. In July 1905, Francisco and Anita satisfied the mortgage on their house in Clifton, paying it off just in time for the birth of their first child Clara later that year. Amalia, born 3 Aug 1911 in Clifton, Arizona, died 2 May 1913 in Clifton, Arizona. From the birth certificate for Francisco’s son Romulo, we learn that in 1906 Francisco was a craneman for the CopperCompany. In the 1910 census he is listed as a 26-year-old having been married for six years. His profession is listed as laborer in the smelter, and his primary language is listed as Spanish. 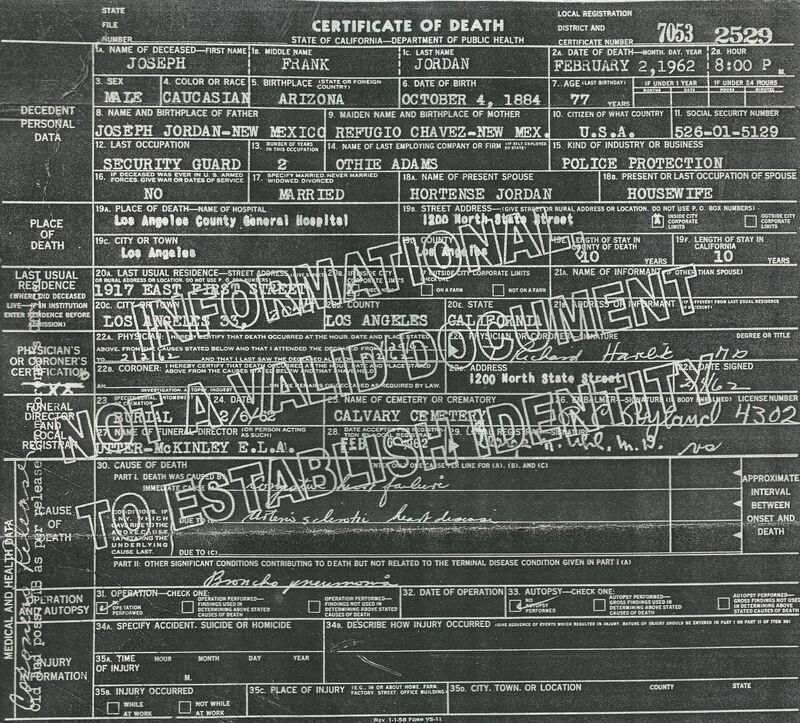 At some point, Francisco changed his name to Joseph Frank Jordan, although we have been unable to determine whether the name change was done officially. We can only surmise that he wanted a fresh start, although since Jordan was the surname of his mother, it was not necessarily a completely new identity. 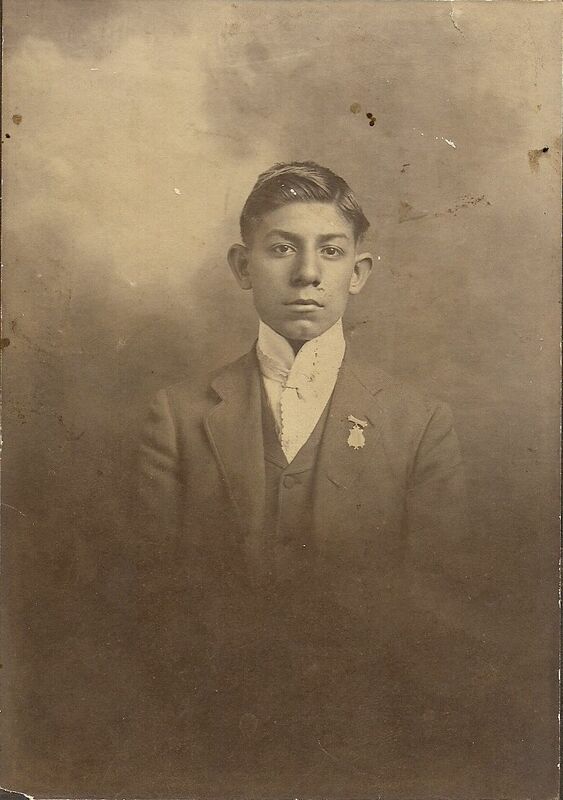 Francisco moved to Ray-Sonora, Pinal, Arizona probably around 1913. The twin towns of Ray and Sonora came into being in 1911 after the Ray Consolidated Mining Company began operations about 80 miles southeast of Phoenix. 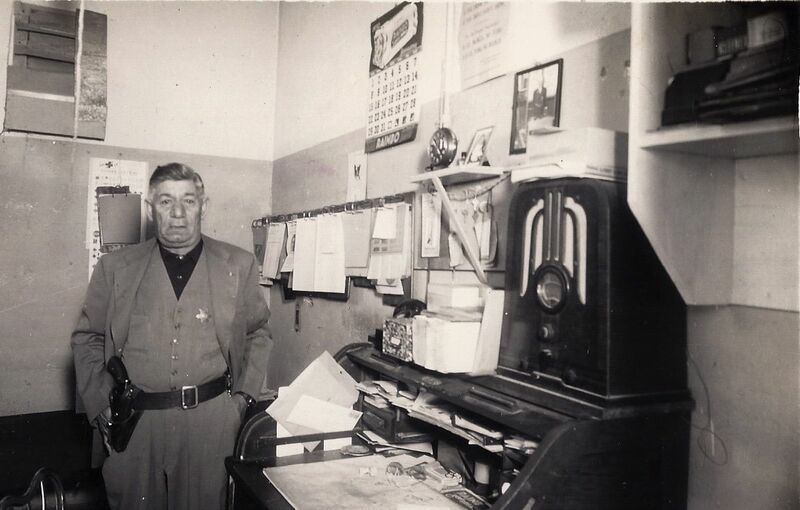 His career in the mining boom town was quite varied, and he served at various times as a machinist, mill crusher, mill foreman, and finally as a Deputy Sheriff. Rogelio Oscar, born 3 Apr 1928 in Ray, Arizona. This branch of “Mirandas” were born as Jordans, a name their descendants carry with pride to this day! In June 1917, Francisco registered for the World War I draft. On his registration, he claims exemption from the draft because of “dependants” (listed as wife and two children). Another interesting piece of information on the draft card is under the subsection race, in which Francisco claims to be Celtic Spanish. While it is possible that he thought the name Jordan eventually traced back to Ireland, our research has taken the name to Lorca, Spain in the late 1600s. Francisco was ultimately not drafted to fight in World War I.
gathered and became a mob, and a riot ensued. Shots were fired and threemen were injured, including another man who eventually died. According to reports, Francisco and the other officer had to lock themselves in the jail while awaiting backup in order to hold off the mob. Following the shooting, Francisco’s eldest son Joe Jr. drove down from Phoenix to get his father, brought him to Phoenix, and helped him get a lawyer. 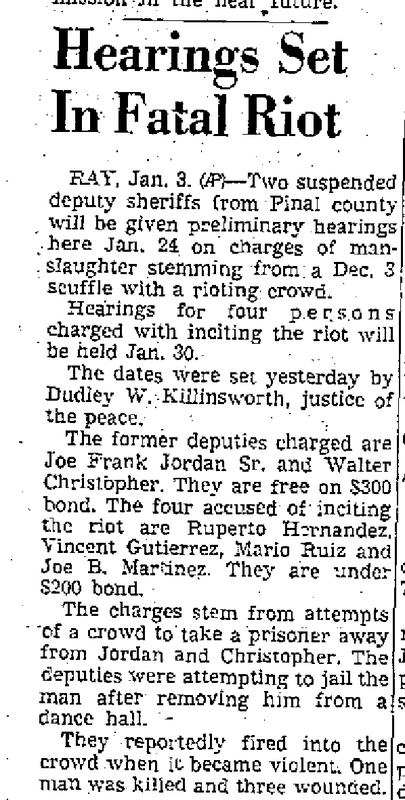 Newspaper clippings from the time reported that Francisco and another officer were charged with manslaughter, but both were acquitted following a trial. 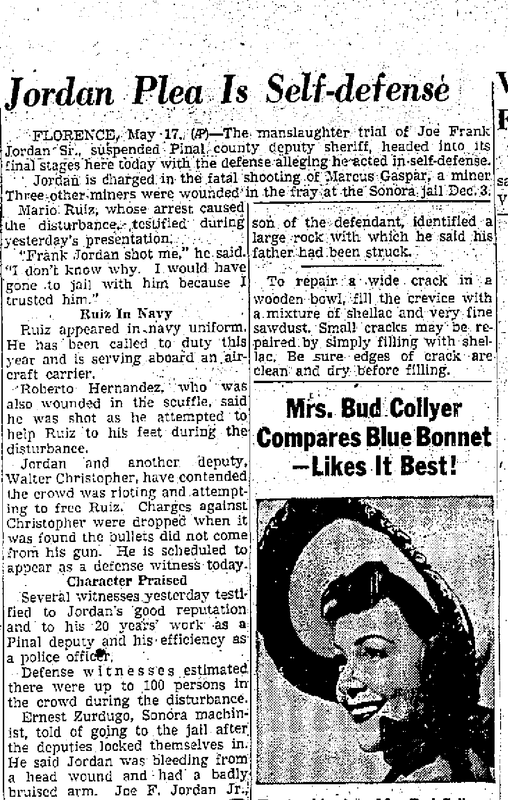 According to the Jordan family, Francisco moved to Los Angeles in 1951 in order to get as far away from Sonora as possible. From various accounts, it appears that towards the end of his life, while living in Los Angeles, Francisco had some contact with his children from the first marriage, primarily Clara and Romulo. He worked in his last years as a private security guard. According to his death record, Francisco died on August 2, 1962 in at the County General Hospital in Los Angeles, California. The primary causes of death were Congestive Heart Failure and Bronchial Pneumonia. He is buried in the Calvary Cemetery in Los Angeles, California.